Multi-Tray’s patented design allows it to hold 50 lbs. of project equipment: paint cans, buckets, tools, window washing equipment, you name it! 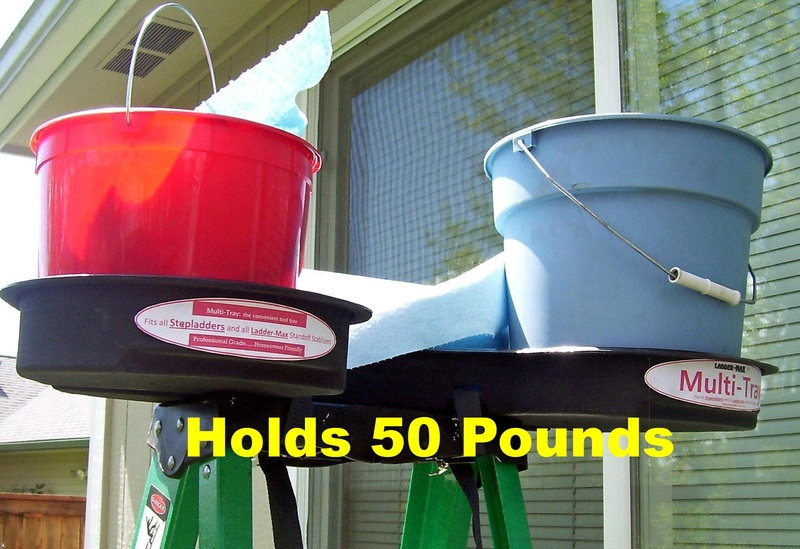 And it's designed to hold two buckets or paint cans at a time. 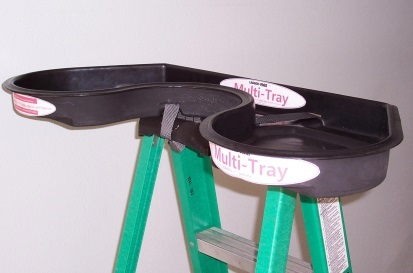 Multi-Tray is an all-around time saver that easily mounts to all step ladders and Ladder-Max Stand-off Stabilizers. 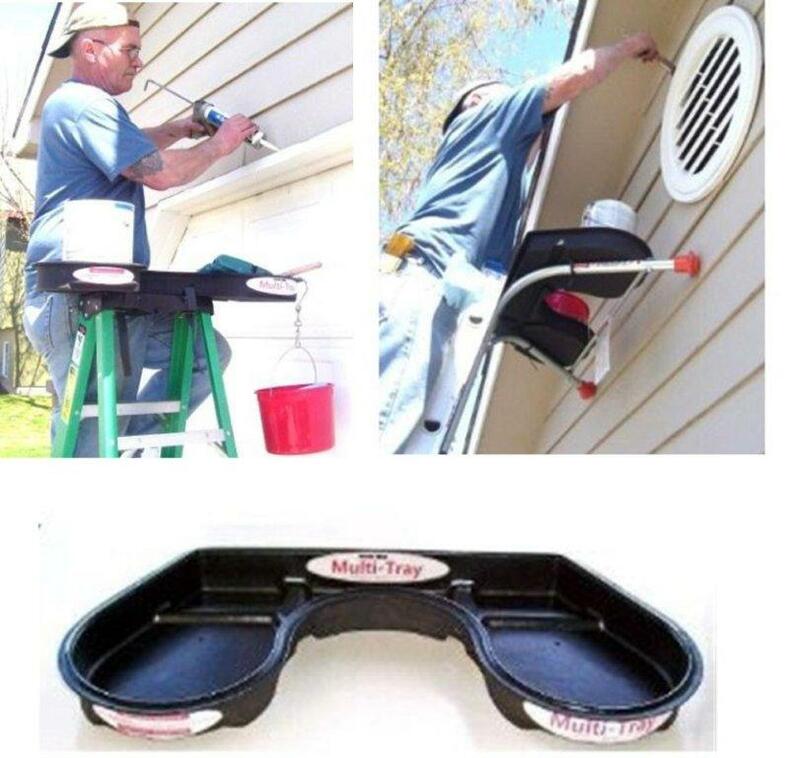 For both contractor and homeowner, this convenient tray will make your job or project much faster to complete. The fewer times you go up and down your ladder, the safer and easier your project becomes. Load it up -- the Multi-Tray is built to take it! Keep your tools close to your project. 1. Use two 1" straps to secure, or purchase the MT 1000 SLMT mounting straps consisting of two 1"x18", 50 pound rated, mounting straps. 2. The Multi-Tray comes with slots in the tray to slide the 1" straps through to easily cinch it tightly to the top of your step ladder. Remove it just as easily by loosening the straps. 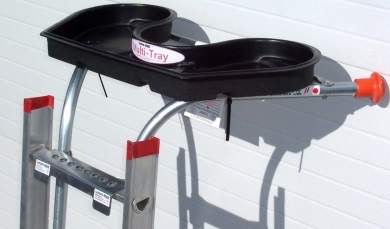 Multi-Tray is conveniently recessed so that it will sit over the top of the cross arm of your Ladder-Max standoff. 1. Multi-Tray is designed with slots in the tray. Slide through the included two reusable 50 pound zip ties. 2. Cinch it tightly to the arms of either your model ABM 2002 fixed arm standoff or your Multi-Pro for Corners and More. Remove it by pressing the release button on the reusable zip tie. Keep your tools closer to your project. This tool and project tray will make all those jobs you perform with a ladder so much easier and safer. Made of 100% recycled durable polyethylene, it holds 50 POUNDS of equipment: up to two paint cans or buckets at a time, screw guns, caulking guns, window washing tools, Christmas lights, gutter cleaning tools, electrical supplies...and light bulbs won't roll off. 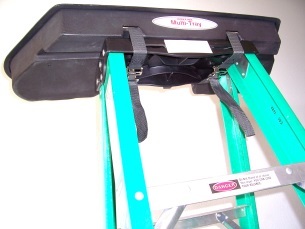 To mount to your Ladder-Max Standoff use the 2 re-usable zip ties included with the Multi-Tray. To mount it to your step ladder, purchase separately the MT 1000 SLMT mounting straps consisting of two 1"x18" straps or use your own 1" straps. Make the most out of your ladder by adding a Multi-Tray. Professional Grade...Homeowner Friendly. I needed to affix my gutters to the house as they were starting to fall away. If I leaned the ladder against the brick I had a very bad angle and could not really get above the gutters. If I raised the ladder the all the weight would be on the gutter. I purchased the Ladder Max Pro with 24" standoff and the work tray. What a difference! The standoffs can rest on the brick or the roof. With the ladder pushed away from the structure I had the perfect angel to work ont he gutters. I also purchased the corner and wide standoffs, but I have not used them. It is also worth mentioning the increased safety with the stabilizer. It is hard to overstate the increase in stability provided by the Ladder Max stabilizer. The ladder simply does not move... even when you lean to one side or the other. Finally... attaching the Ladder Max to different ladders is super easy and quick. I highly recommend this tool to anyone that goes up and down ladders. I have a 32 foot ext ladder for my 2 story house. A storm blew off one of the tiles on the edge of my roof by the top (25 ft). I had a hard time installing the new tile since all the tiles on the edge were loose and my ext ladder rested under the over hang. Carrying the roof tile, drill, screws and holding on to it at the top was a chore. Plus it was a bad angle since I was under the over hang. I bought ladder-max stabilizer and tray. What a difference! The right tool for the right job saves so much time and labor. I anchored all 35+ roof tiles on the edge with my Dewalts drill and screws. Sometime later I started a new project. I started to scrape all the old paint off of my overhang eves for a two story home (theirs a lot of area to cover) and then painted it. With the stabilizer and tray it gave me the right angle to be able to work - scrape, caulk and paint besides the tools such as a hammer, drill, putty knife and etc). Who wants to be constantly going up a 32 ft ext ladder for tools? I use the tray on my 12, 10, 8 and 6 foot A ladders. 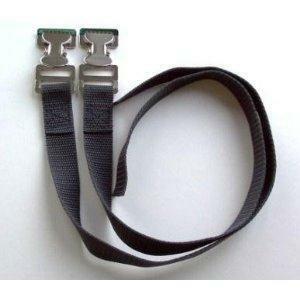 Do not forget to buy the straps since they do not come with the tray. The straps are a must and are of very good quality just list the stabilizer and tray. Oh buy the way as I was trying to move my 32 ft ext ladder it fell away from my house onto the street with and empty tray and stabilizer. I was amazed to see that neither the stabilizer or the tray were damaged. They are of the best quality. Very durable. If I had to do it again I would not climb another ext ladder without the stabilizer and tray. Another great transaction & item! Quick to ship & good comm. This multi-tray is a good product. Anyone that has tasks that require lots of time on a ladder knows how tedious it is to have to go up and down to get tools, paint, etc. The tray holds a lot and the set up is easy. The tie wraps don't last too long so I just need to find more re-useable ones. Overall, very happy with this product and would recommend. I have all of the ladder max stand off products. This tray is expensive for what you get, but if you have ever tried to work from a ladder without one, lets just say everything you need is either on the ground or hanging somewhere and you spend your time looking for it. It's best to just go ahead and (buy it now), one job will make it worth it! Great product. The tray attached securely and quickly to both my step ladder and the Ladder-Max stand off stabilizer. I used the tray on my step ladder on a recent garage rafter project and I was able to place my drill,tape measure,hammer and nails in the tray without the fear of them falling out. Easy access was another plus. I also used the the tray on my Ladder-Max stand off stabilizer when I put up my Christmas lights. The reusable wire ties are a quick and easy way to secure the tray to the stabilizer. Works great. I have recommended this product to family and friends. Fast shipping also.